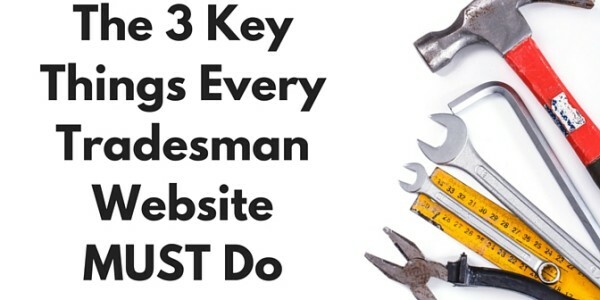 Many tradesmen have websites already but very few know how to use them properly. By optimising tradesman websites to work with Google, we can increase your online traffic and incoming work dramatically. Optimising your website properly means that you have a better chance of being the first name Google shows when somebody searches for your services in their local area. With Google being the main search engine used by the majority of people in the UK, it’s important to be as visible as possible. If you are the top of Google’s search results, it’s 38% more likely that people will look at your website before looking at others. Optimising your website doesn’t have to take a long time, and there are some quick adjustments you can make to improve the amount of work you are getting online. A clear website layout allows you to provide information about your services quickly. Customers don’t spend much time reading all the content on a website, so making sure you show your services, contact details, and location prominently is a great way to streamline their experience and get more calls as a result. Your website is the perfect place to show your customers who you are, what you do, and what you offer that other tradesmen can’t. It also allows you to also show off your previous work, reviews and testimonials, and to explain what sets you apart from the competition. People want to buy from people, so the more experienced, friendly, and professional you appear, the more likely they’ll pick up the phone and call you. Although it’s important to include information about your business, your customers aren’t going to be interested in reading about your company history when their bathroom is flooding. Ensuring that your contact details and phone number are easy to find improves the chances of people calling you straight away. If your customers are in a rush and can’t find your contact details easily, it’s likely they’ll click the back button and look elsewhere. If you’re interested in finding out more ways to get work from your tradesman website, order our FREE DVD: A tradesman’s guide to getting work from the internet.